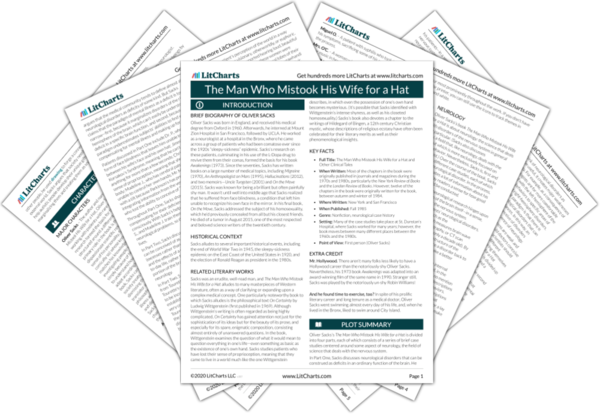 Welcome to the LitCharts study guide on Oliver Sacks's The Man Who Mistook his Wife for a Hat. Created by the original team behind SparkNotes, LitCharts are the world's best literature guides. A concise biography of Oliver Sacks plus historical and literary context for The Man Who Mistook his Wife for a Hat. A quick-reference summary: The Man Who Mistook his Wife for a Hat on a single page. In-depth summary and analysis of every Chapter of The Man Who Mistook his Wife for a Hat. Visual theme-tracking, too. 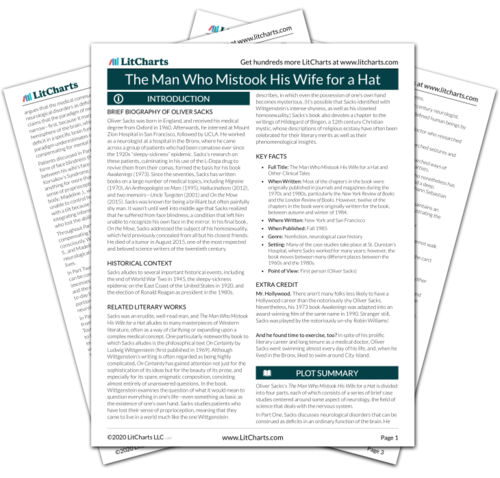 Explanations, analysis, and visualizations of The Man Who Mistook his Wife for a Hat's themes. The Man Who Mistook his Wife for a Hat's important quotes, sortable by theme, character, or Chapter. Description, analysis, and timelines for The Man Who Mistook his Wife for a Hat's characters. Explanations of The Man Who Mistook his Wife for a Hat's symbols, and tracking of where they appear. An interactive data visualization of The Man Who Mistook his Wife for a Hat's plot and themes. Oliver Sacks was born in England, and received his medical degree from Oxford in 1960. Afterwards, he interned at Mount Zion Hospital in San Francisco, followed by UCLA. He worked as a neurologist at a hospital in the Bronx, where he came across a group of patients who had been comatose ever since the 1920s “sleepy-sickness” epidemic. Sacks’s research on these patients, culminating in his use of the L-Dopa drug to revive them from their comas, formed the basis for his book Awakenings (1973). Since the seventies, Sacks has written books on a large number of medical topics, including Migraine (1970), An Anthropologist on Mars (1995), Hallucinations (2012), and two memoirs—Uncle Tungsten (2001) and On the Move (2015). Sacks was known for being a brilliant but often painfully shy man. It wasn’t until well into middle age that Sacks realized that he suffered from face blindness, a condition that left him unable to recognize his own face in the mirror. In his final book, On the Move, Sacks addressed the subject of his homosexuality, which he’d previously concealed from all but his closest friends. He died of a tumor in August 2015, one of the most respected and beloved science writers of the twentieth century. Sacks alludes to several important historical events, including the end of World War Two in 1945, the sleepy-sickness epidemic on the East Coast of the United States in 1920, and the election of Ronald Reagan as president in the 1980s. Sacks was an erudite, well-read man, and The Man Who Mistook His Wife for a Hat alludes to many masterpieces of Western literature, often as a way of clarifying or expanding upon a complex medical concept. One particularly noteworthy book to which Sacks alludes is the philosophical text On Certainty by Ludwig Wittgenstein (first published in 1969). Although Wittgenstein’s writing is often regarded as being highly complicated, On Certainty has gained attention not just for the sophistication of its ideas but for the beauty of its prose, and especially for its spare, enigmatic composition, consisting almost entirely of unanswered questions. In the book, Wittgenstein examines the question of what it would mean to question everything in one’s life—even something as basic as the existence of one’s own hand. Sacks studies patients who have lost their sense of proprioception, meaning that they came to live in a world much like the one Wittgenstein describes, in which even the possession of one’s own hand becomes mysterious. (It’s possible that Sacks identified with Wittgenstein’s intense shyness, as well as his closeted homosexuality.) Sacks’s book also devotes a chapter to the writings of Hildegard of Bingen, a 12th century Christian mystic, whose descriptions of religious ecstasy have often been celebrated for their literary merits as well as their phenomenological insights. When Written: Most of the chapters in the book were originally published in journals and magazines during the 1970s and 1980s, particularly the New York Review of Books and the London Review of Books. However, twelve of the chapters in the book were originally written for the book, between autumn and winter of 1984. Setting: Many of the case studies take place at St. Dunstan’s Hospital, where Sacks worked for many years; however, the book moves between many different places between the 1960s and the 1980s. Mr. Hollywood. There aren’t many folks less likely to have a Hollywood career than the notoriously shy Oliver Sacks. Nevertheless, his 1973 book Awakenings was adapted into an award-winning film of the same name in 1990. Stranger still, Sacks was played by the notoriously un-shy Robin Williams! And he found time to exercise, too? In spite of his prolific literary career and long tenure as a medical doctor, Oliver Sacks went swimming almost every day of his life, and, when he lived in the Bronx, liked to swim around City Island. Arn, Jackson. "The Man Who Mistook his Wife for a Hat." LitCharts. LitCharts LLC, 17 Apr 2017. Web. 24 Apr 2019. Arn, Jackson. "The Man Who Mistook his Wife for a Hat." LitCharts LLC, April 17, 2017. Retrieved April 24, 2019. https://www.litcharts.com/lit/the-man-who-mistook-his-wife-for-a-hat.